← A start ! is a start ! is a start ! This Wednesday sees many of the same projects as last week on the needles with a slight exception to one project and a new book ! On the left is the In Three’s cardigan, about another inch and it will be ready to start the bottom band, its hard to see all bunched up but it is nearly there ! Top of the picture are the Right Twist Cable Rib socks which are coming along slowly. One more pattern repeat and it will be time to start the heel. On the left are some mini crochet hearts I’m doing up for Valentines Day to make a heart tree, these I’m expecting to be finished this evening as they are quick and easy but also tomorrow is Valentines Day lol. 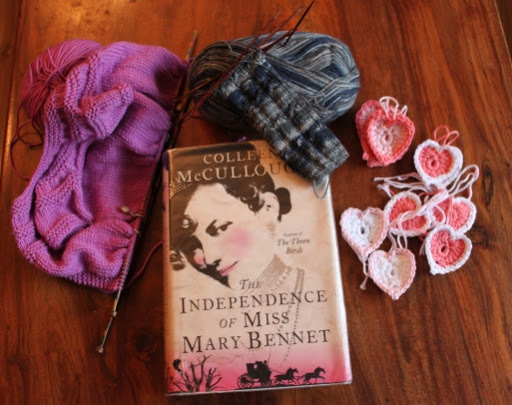 The book I’m reading at the moment is The Independence of Miss Mary Bennet which I started at the weekend and I can’t say I’m yet enjoying it, I suspect its going to be a slog to get through. I’m only around the 100 page mark and I’m wondering what my next book to read shall be ! This entry was posted in Uncategorized and tagged In Three's, Mini Hearts, Right Twist Cable Rib Socks, WIP Wednesday, Yarn Along. Bookmark the permalink. Did you bunch up the In Threes to keep us from seeing properly until Friday? LOLCute little hearts. I hope you'll show us the final assembly. I'm feeling a bit out of sorts about V-Day this year but that may change as I just discovered a Lindt outlet store near work! A heart tree sounds adorable. Hope you can make it happen. That's funny because I posted with WIP's (not too many with any progress) and a book I just finished.I was saving my sock until tomorrow else my regular bloggers get tired of seeing it! LOL!Your little hearts are so sweet! Happy Valentine's Day to you and your family! How awful to read a boring book. It was like that with the Salem Witch Trials chronicle. I couldn't get through the preface!Your projects in progress look great so far!